Early Style Reproduction Electric lamps!!!! Hall lanterns of this design were originally made in the early 19th century for use in British Colonial and American Colonial homes. Used to illuminate as well as to decorate entrance halls, foyers, and hallways, the hall lantern offered good lighting and a warm welcome to visitors of the early colonial homes. Our replica Hall Lanterns are all handmade like the early 19th century originals. The glass domes and smoke bells are hand blown and have copper wheel engraved motifs. The solid brass hardware is also handmade, including the canopy, chain, bezel bauid with griffin head hooks, and ventilator cap. We now offer your choice of 3 hardware finishes: antique brass, pewter, or polished and lacquered brass. Our Hall Lanterns are offered in five sizes and each is equipped with 20" of adjustable drop chain. 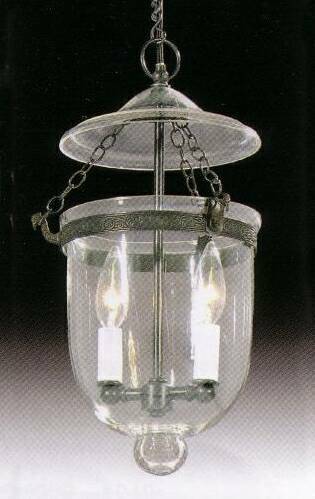 • Tiny Hall Lantern with glass dome diameter of 7" X 9 1/4" deep and adjustable ceiling drop from 20 1/2" to 39". This size is recommended for 8' and 9' ceilings. • "New England" Design Hall Lantern w/glass dome diameter of 91/z" X 9" deep and adjustable ceiling drop from 19" to 40". This size is for 8' and 9' ceilings. We ship these lanterns electrified. There is a small amount of assembly required on the customers part since the glass components are packed separate from the brass components to avoid damage. Tiny hall lantern with clear glass dome. 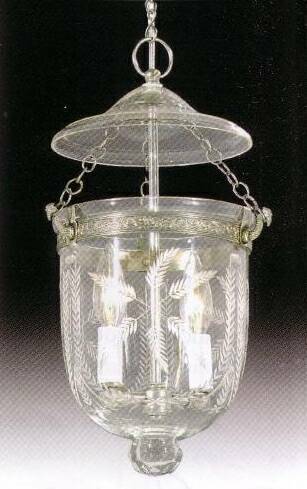 Tiny hall lantern with "Floral Foliate"
Tiny hall lantern with "Laurel Swags"
"Tiny Hall Lantern" 7" x 9 1/4" deep dome, adjustable drop from 20 1/2" to 39". This size recommended for 8' and 9' ceilings.